What does it take to capture the whole world into a single frame? A few technical bits, a lot of creativity, and your view can become a masterpiece. Welcome to the forth part of Fashion Potluck’s Photography series! On the first part we covered all the technical aspects of a DSLR camera, shooting modes and exposure, so that you can have full control of its potentials. On the second part we talked about composition and how you can bend a few rules while keeping others to find your personal style and improve your artistic vision, while on the third one we mastered the art of shooting stunning portraits. 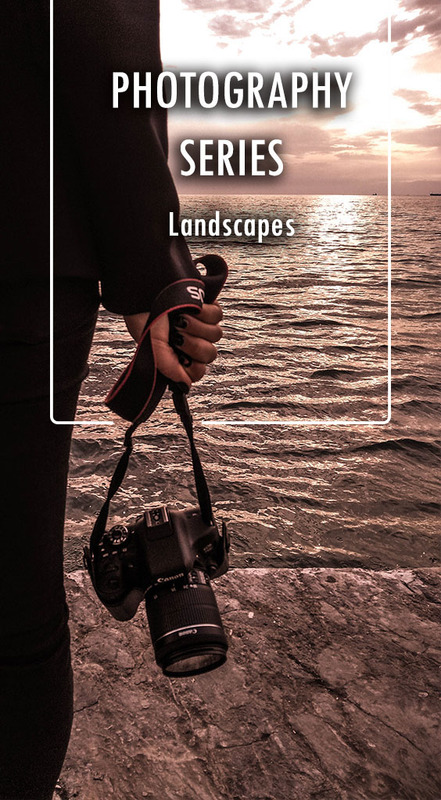 Today we are going to talk about landscapes and how to beautifully capture whatever is in front of you, whether it’s the lapping waves of the ocean or the brick-built building across the street, landscape photography can be truly impressive. Unlike portraits when you are photographing landscapes you want to make sure that as much of your scene is in focus as possible you need to be aware of your depth of field. To achieve that you choose a small aperture setting as the smaller your aperture the greater the depth of field in your shots. Keep in mind that larger numbers of aperture mean a smaller aperture. If you need to freshen up your knowledge of exposure (aperture, shutter speed, ISO go back to the first part of our series to find everything you need to move on). Now with the smaller aperture you get less light in your lens hence a darker image so boost the ISO to compensate, or go for a slower shutter speed. You may have overheard your photographer friends talking about the golden hours and wondering what that is. It’s the time right before sunset or sunrise. So you get your golden fix twice a day. There’s a soft, diffused light during those hours that helps reducing glare and harsh shadows. In plain words, everything looks prettier during the golden hours. If it’s a cloudy day, even better believe it or not. The clouds double as a natural soft box and filter the light. In photography terms that means you get a soft, lovely light instead of harsh light and shadows to interrupt the landscape. When photographing a landscape pay attention to the line of the horizon. Technically the straighter it is the more professional your image looks. It’s up to you to decide whether that rule is one to follow, break or bend. There’s also another compositional guideline which suggests a rule of thirds regarding the horizon. You divide your image into thirds horizontally and place the horizon on one of those lines to add depth and interest. The rule of thirds usually works well and it’s a reliable technique regarding all sorts of subjects. Maybe you are thinking of the bigger picture here, and you should, it’s all about the complete landscape but having a focal point helps a lot. The human eye rests naturally on the focal point provided by the photographer and that instinctively gives us the illusion of purposefulness and proper order which our brains love. Without a focal point you are just presenting what we call “empty space”. Sometimes just a still landscape is not enough. When you feel that something is missing it’s either a focal point or movement. You can use long exposure to capture the movement of water, the fluttering of a bird’s wings, traffic lights or a shooting star if you are lucky. Photography is an “art” that keeps evolving with you. Practice makes perfect, so get your camera and try to see things differently and find beauty everywhere! See you out there! Sam L : Some really fantastic photography tips. Many of those features are offer via my OnePlus 6 camera, which come in handy often. Will be handy to utilise these tips to make the most of my camera. Chelf C : I'm so glad you found it helpful Sam! Stay tuned for more!